Thanks for all the great feedback on the homemade artwork. It realy helps to have a creative peanut gallery/ sounding board for what is rattling around in my brain. In case anyone was wondering, the large frame is going over the fireplace that is across from , not over the bed. As for this photo series, I still really love how they look by themselves but I think you all have confirmed my feelings on it being too busy for over the bed. Centsational Girl suggested I try to take out the color. Had to give it a go as a final hooray. I think that might help the problem a little...I dont like the pieces quite as much and it still too much going on. Now that I've accepted they just won't work over the bed, maybe I should move them to a different spot in the room instead? I took this old photo from before we moved our furniture in (this is the view to the left of the bed) and added that plain Target slipper chair with 2 of the 3 prints. I'd probably add a pillow that brings in some of the colors of the room as well. What do you think? If this works out, I'd still get to see their passionate/tragic message without creating sensorary overload on one side of the room. And these were my two favorite anyway. Doublescore - cheaper and better! Obviously, that leaves the space over the bed bare. Not sure if there needs to be anything there at all...sometimes less is more. I'll have to have a think. Damn, I have a lot more to do than I realized!! Motivate me before I crawl under the covers and forget it all! I admit, I'm being a total cheapskate here because I'm having a hard time parting with $150 for acrylic lamps but I love the shape, I just need to get over it! But while we are on the topic of Suzie's bedroom...how fabulous is this? I know its all from Ikea but swoon. One of my favorite examples of taking something easily attainable and making it extraordinarily beautiful!! Thanks for the inspiration Suzie. Much better, both color and placement. Those lamps ARE great but yeah $150 for acrylic lamps would really stick in my craw too! I don't think it's about being a cheapskate at all. In my opinion, the bed is great enough - let it speak for itself! I say nothing above the bed. I like the pictures by the chair instead. It still looked busy over the bed even with the adjustments. I'm sure you posted it somewhere, but what color are the walls in your bedroom? Thank you. I love the bed without the art above too...but it looks fab in the corner! Have you considered some ironwork above the bed...to draw on the detail in the bedding? 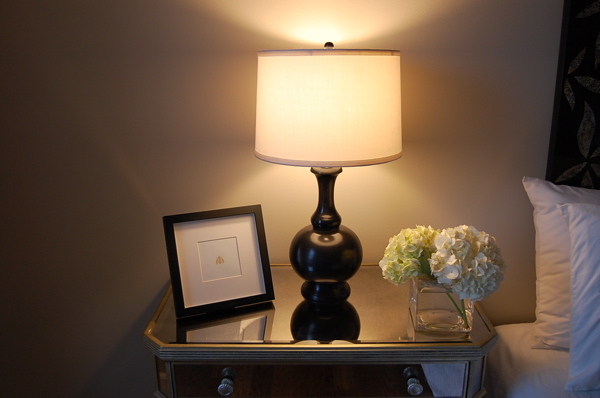 Bummer about those lamps...the black would look fabulous in there! i noticed recently that one of my favorite designers for inspiration, sarah richardson, rarely puts anything over the bed and it always looks wonderful. i love the lamps and the headboard so i say get tackle the rest of your to do list (incl. the two prints over the chair) and then see how the room feels to you. The bed is gorgeous and the prints as a pair look fab on the other wall, xv. love the pictures much more by the slipper chair - i think you have a winning look! Ooh... this I like. The two prints on the other wall with the chair = fantastic. Maybe with the cash you save doing only two prints and nothing above the bed (I think the bed adorns that wall all by itself quite nicely), you can more easily rationalize the cost of those fabulous lamps. Naz: The color on my walls is Benjamin Moore Silver Marlin. Aww, thanks Mrs. L! I'll let you know the next time the lamps are on sale, I picked them up for $50 a piece! I love the new arrangement! It really shows off the colors and patterns within the painting, especially with the crisp white slipper chair! Perfect! I like them moved much better. Your headboard is beautiful and I wouldn't want to distract. they are much better on the other wall. Love the lamps. Spend the $150 they are awesome! Wow, your bedroom is beautiful. I love the wall color and the pristine trim. Also, your bed...so pretty! Oooh, they are so nice as a PAIR (tee hee) on the opposite wall. I can see how your room will be pulled together so beautifully once you get all of your wishes ! see I know your taste...i knew you would like those pictures I posted.. Thanks so much Mrs. L.
I really like the two pictures in the corner. And the slipper chair looks great, too. I have to agree with the others who suggest putting nothing above the headboard. love the pictures, but I agree not over the bed. 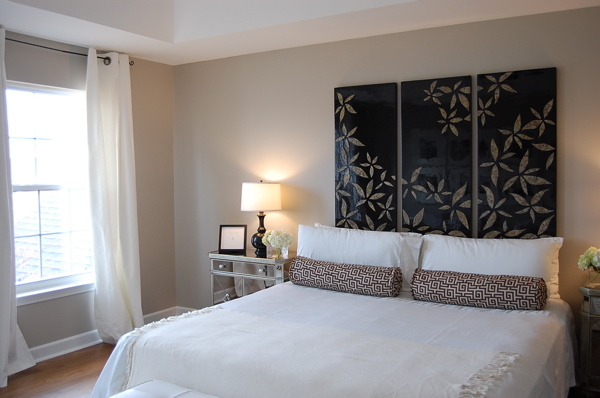 What if you took the paint color you have now and made it a few shades darker or lighter and painted a kinda faux headboard around your tufted headboard- like not the whole wall just a larger square where the bed and end tables can float in it. Its a cheap option and offers somethign going on over the bed for now. Down the road if you hate it you can paint it right back over. I agree....the pictures over the bed are a bit busy. I would go with the fabulous lamps you have chosen and some wonderful, graphic black & white pillows for the bed...some black velvet pillows would look great! 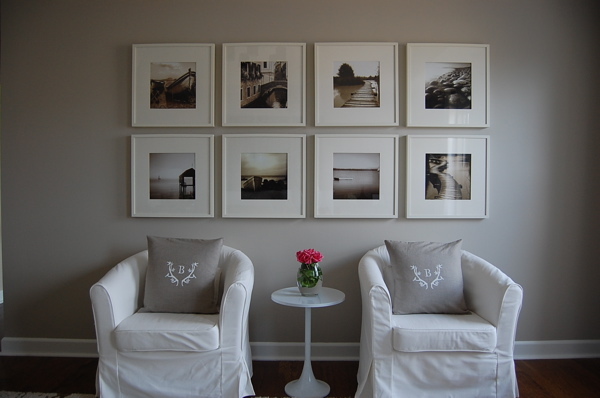 The 2 pictures with the slipper chair in the corner look great...maybe hang a simple white plate above the pictures. I'm having a great time catching up on your blog...I just read through the comments on your last post (isn't it great to get input from these creative folks?! I should have posted many more questions on my blog before I pulled the trigger on some of the purcahses I made!). I love them over the slipper chair. Now they don't compete at all with your fabulous bedding. Perfect! I think If you must have something over the bed maybe a large frame with chalkboard paint inside where you can write a quote or just leave it blank:) The corner pictures looks great, maybe a picture behind the chair on the left side too?